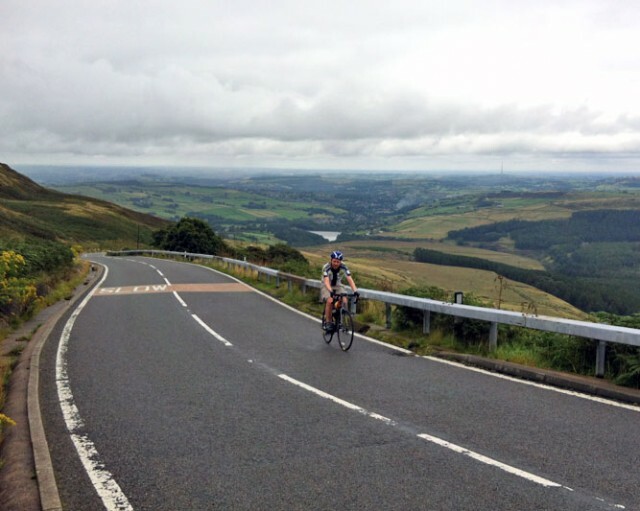 Holme Moss is an iconic British hill climb used in many big races, such as the Tour of Britain and the now defunct Leeds Classic. 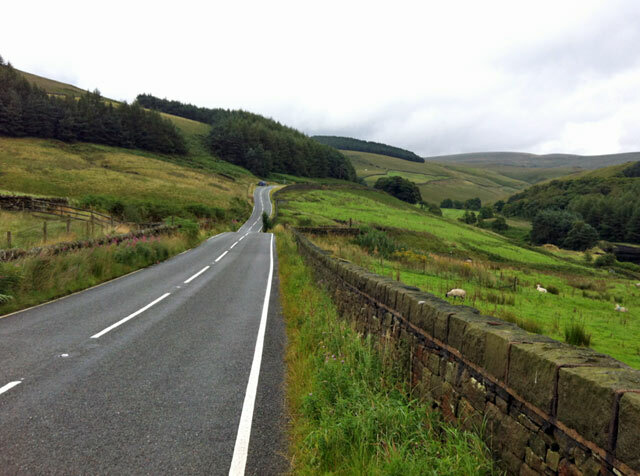 It is also used in quite a few cyclo sportives, such as the Tour of the Peak, and also hill climbs. 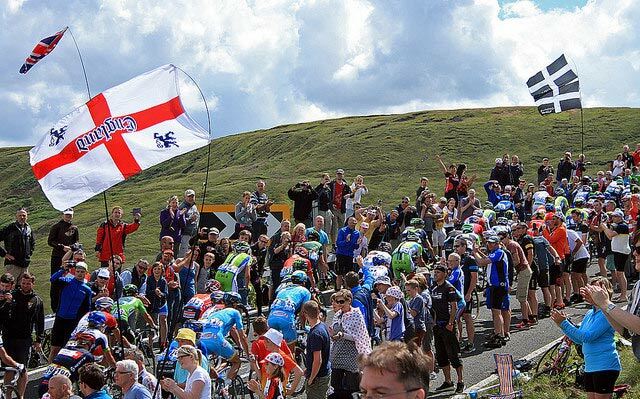 Because of its history and epic length, Holme Moss has become a popular venue for road cyclists – it featured in Sky’s top 10 places to ride, and also the first edition of 100 Greatest Hill Climbs (#43). 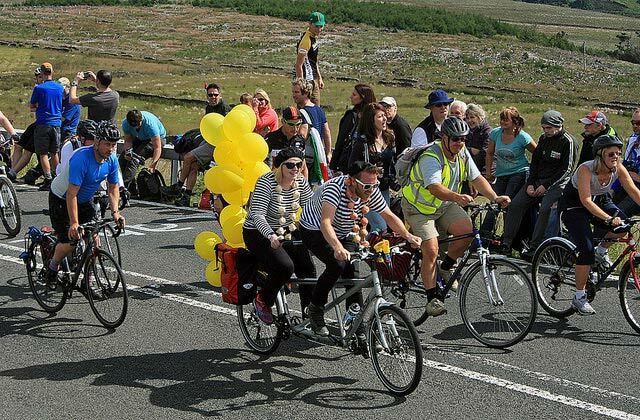 However, all this history was trumped by featuring in stage two of the 2014 Tour de France. 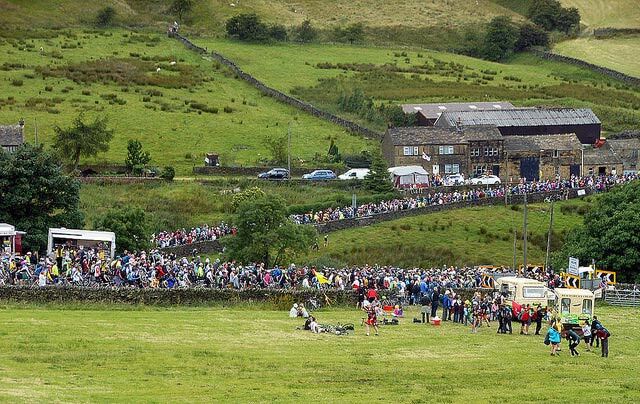 The crowds on the slopes of Holme Moss had to seen to be believed. 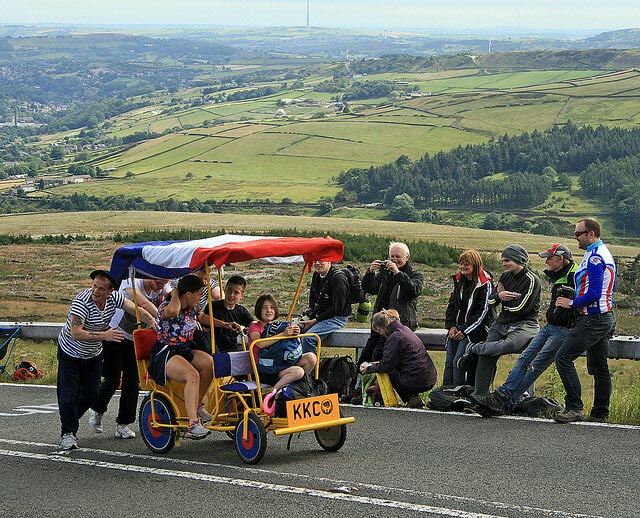 Thanks to Camperman64 (flickr) for permission to use photos of Holme Moss from Tour de France. 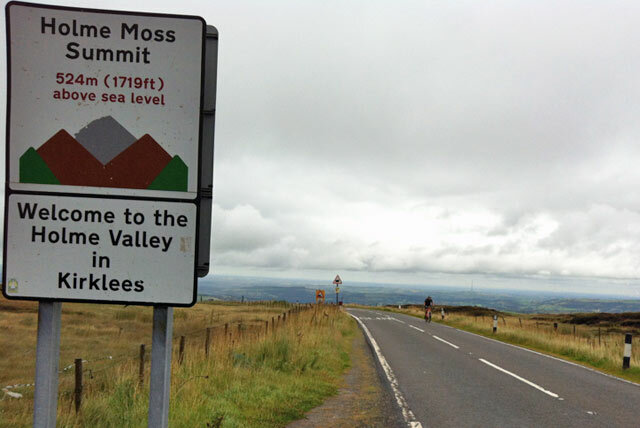 Holme Moss is on the border of Yorkshire and Derbyshire – 11 miles south of Huddersfield, 27 miles west of Sheffield and 21 miles east of Manchester. 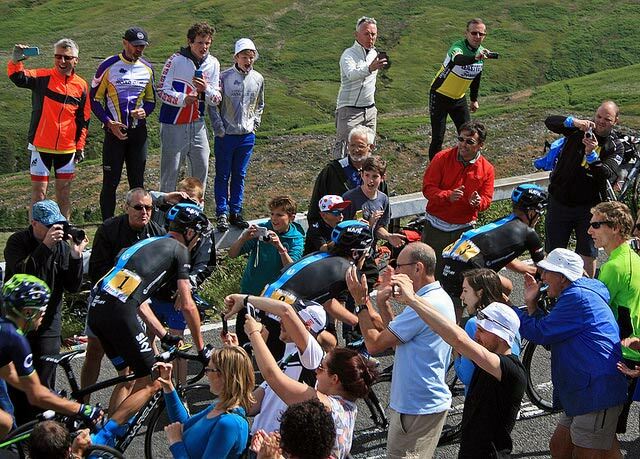 In July 2014, an estimated 60,000 spectators were on the climb – officials had to draft in extra stewards to try and keep the road safe. Former British cyclist, Rob Hayles remarked that the number of tents in the fields reminded him of Glastonbury. 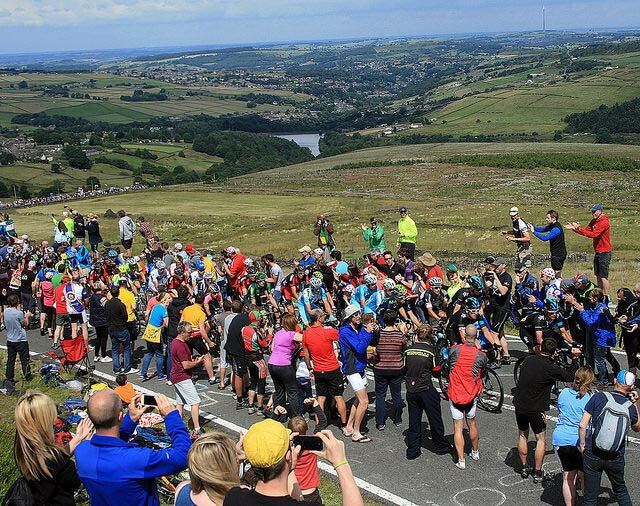 Both Chris Froome and Geraint Thomas said that riding up Holme Moss ‘gave him goosebumps’ such was the noise and atmosphere. 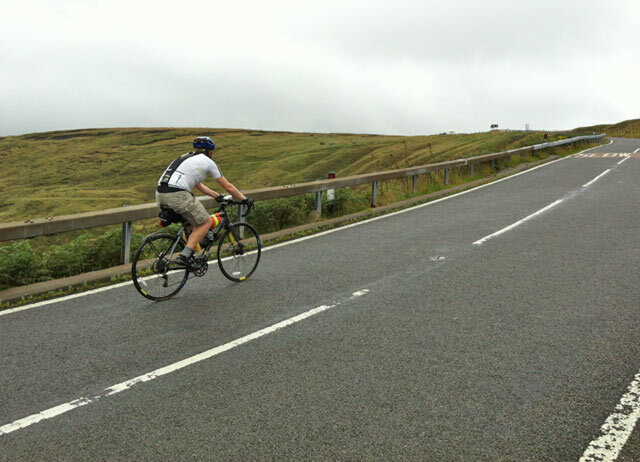 There are two ways to climb Holme Moss – from Holmfirth (north to south) and from Woodhead Reservoir (south to north). At it’s peak the climb reaches 524 metres (1719 ft). 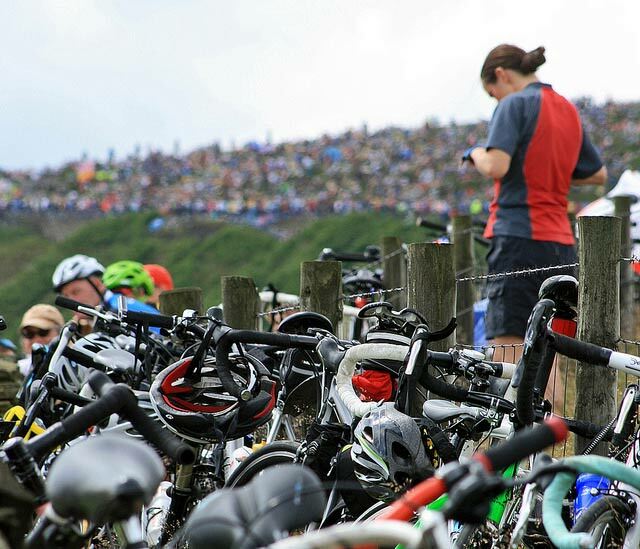 There is a small car park at the top, where you can often see cyclists recuperating before they descend back down! The climb from Holmfirth is better known and is longer, though from south upwards is also a good test. A shorter version of the climb is the last 1.5 miles. It is this section which is the steepest. The first 3 km is quite a gentle gradient. It is only after the village of Holmbridge that it gets steeper. From Holmbridge to the top it averages over 7%. It is long and unrelenting. It is quite exposed so if the wind is in the wrong direction, it can make the climb even tougher. The toughest section is the last few kms, the gradient is a relentless 10-13%. You’ll be in your lowest gear or close by this point. Not because it’s so steep, but because the hill wears you down. Someone has marked the last mile, 1/2 a mile and 1/4 mile. It’s nice to see these signs as you hold on for the top. This tourist had a bit of extra weight on his bike and was really struggling up the top of the climb. Poor chap, he was really grovelling up here at about 4 mph. – just determined not to get off and walk. Holme Moss from Woodhead reservoir does not have the same height gain. But, it is still a tough climb, with another long drag reaching a maximum of 12%. Holme Moss south side in winter. The road can get closed, so be careful. Glossop Kinder Velo put on some club events on this climb. You can turn up and have a go. 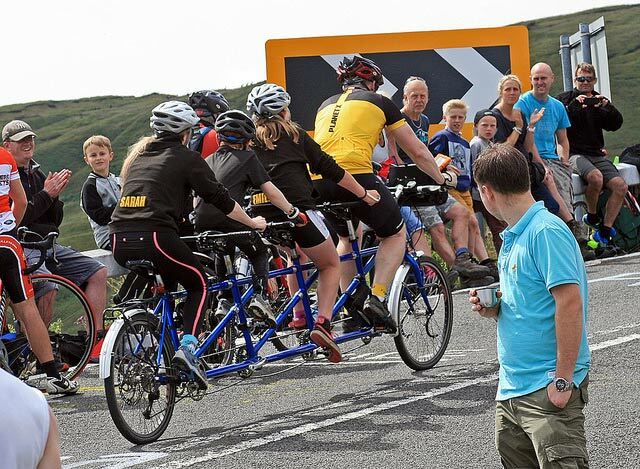 Checkout Holme Moss hill climb at Glossop Kinder Velo. 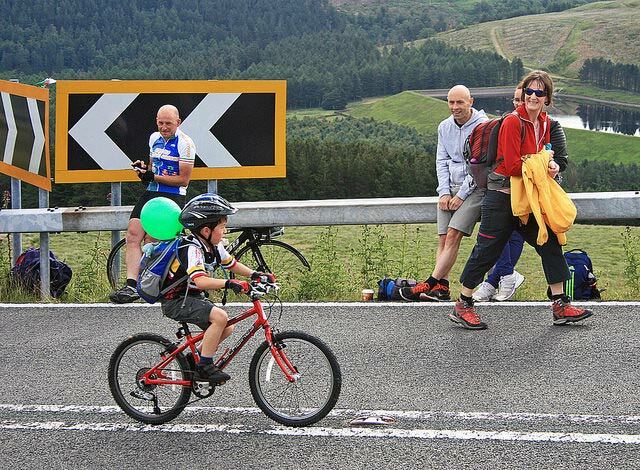 Holme Moss – photo camperman64 – we start ’em on the hills early in Yorkshire! 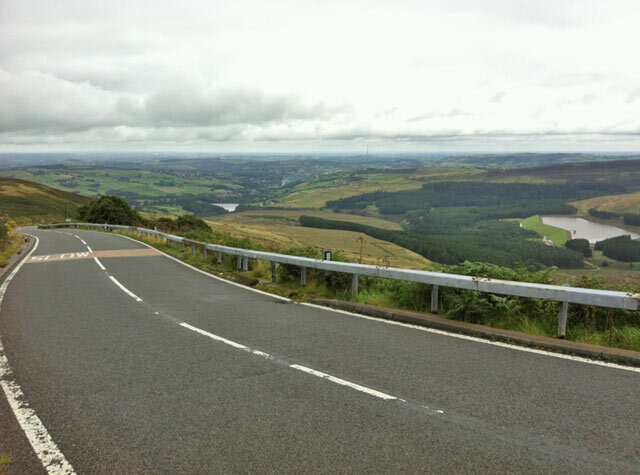 I rode Holme Moss both directions in September, 2012 after the Snake Pass hill climb. After the Snake Pass hill climb I recuperated a little in the HQ, had some food, and then pedalled over to Woodhead reservoir. It’s only about 5 miles from Glossop on the lumpy and windy B6105. Traffic is reasonably light, though the road has potential to be dangerous. After Torside reservoir, there’s a nasty right turn on to the A628 (cars are travelling fast and there’s limited sight). 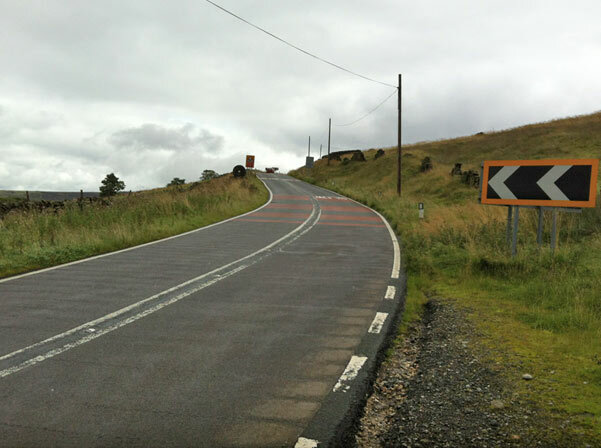 After half a mile, you can turn left off the busy A road onto the quieter A 6024 which takes you up to Holme Moss. At the start, there is a short incline before a descent taking you back down to 250m. But, once you leave a feeder reservoir to Woodhead Reservoir behind, the road is all up hill. It’s a tough consistent climb. Often reaching 10-12%. You need to find a good rhythm because there’s no let up for the next few km. You will want to be seated for most of this climb. As the road gets closer to the top, it is more exposed so any headwind will make the going more difficult, though the gradient does start to ease gradually. The road is fairly straight, and looks imposing from a distance. 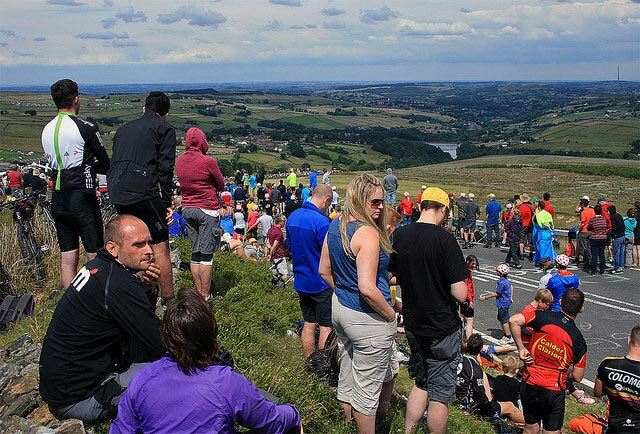 After a final corner, you’re rewarded with great view down towards Holmfirth. The whole climb took me about 12 minutes, which was with a nice gentle tailwind. After descending to Holmfirth, I did a U-turn and began the long drag back up. After just climbing the other side, the legs were starting to feel all the climbing, but at the start, the gradient is fairly gentle. It is after the village of Holmbridge that it gets more interesting. 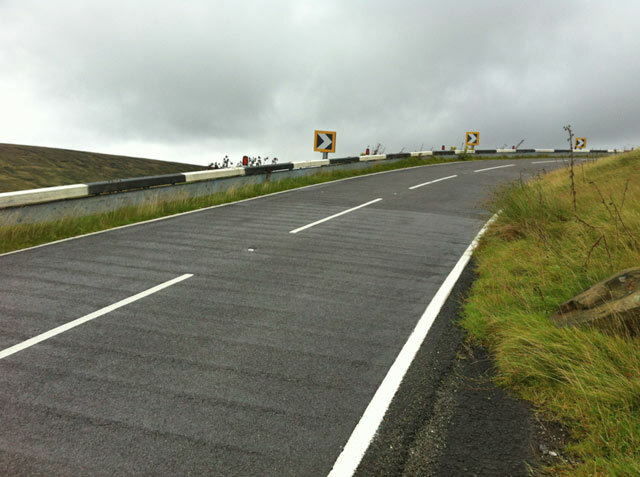 After Holme, there are a couple of hairpins and the road reaches its steepest part 13%. There is then little respite until you reach the top. From Holmbridge, it could take you 15-30 minutes to do the climb. Holme Moss in March. 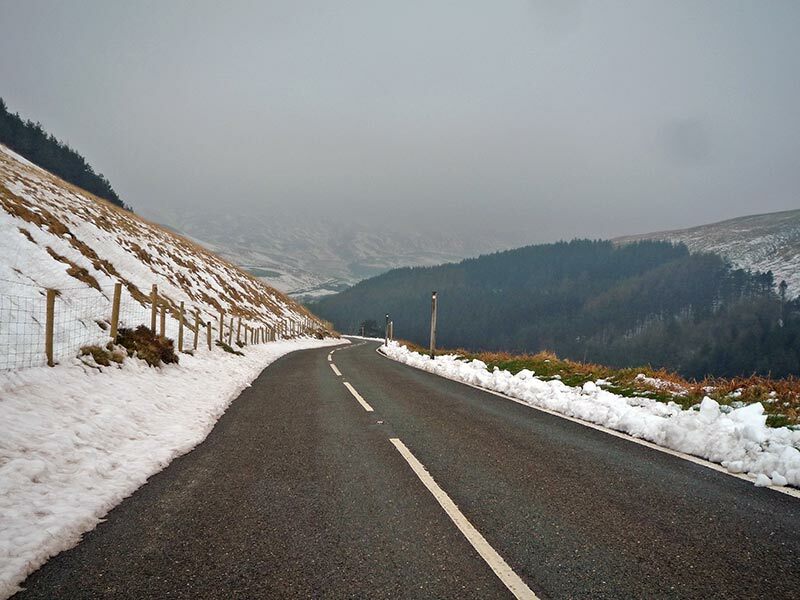 With any snow, Holme moss often gets closed. If there are signs saying road closed – believe them. You can get big drifts of snow, even when there is little snow lower down. 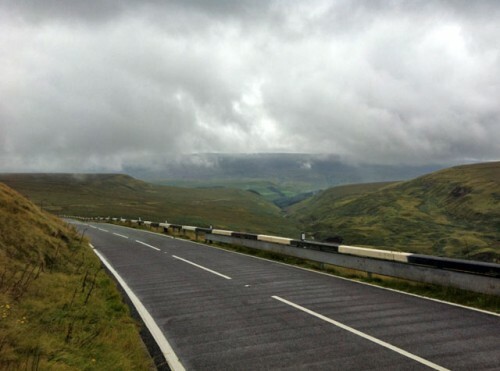 I was due to ride the Holme Moss hill climb in October 2013, but it was called off due to bad weather (poor visibility) at the top. After Ladybower reservoir turn left up Mortimer road and on towards Langsett reservoir and head north up to Holmfirth. From Holmfirth you take the Holme Moss climb to Woodhead reservoir for final stretch back towards Glossop. You’re spoilt for choice in this part of the world. 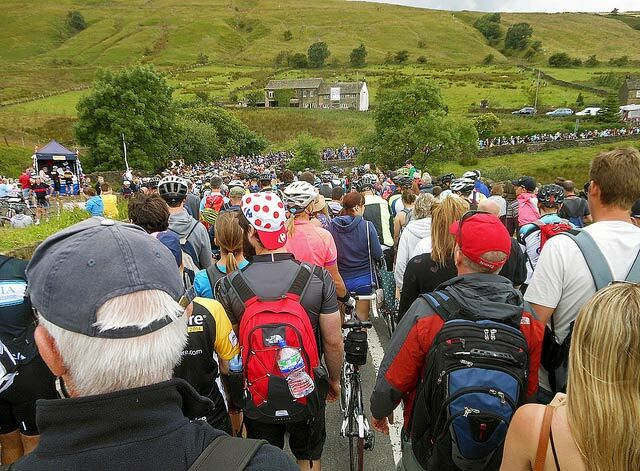 The Tour of the Peak takes in Snake Pass and then the steeper Winnats Pass near Castleton in the Vale of Eden.